Yeni Gonzalez (center), a Guatemalan mother who was separated from her three children at the U.S.-Mexico border, is embraced by volunteer Janey Pearl Starks as pictures of other children separated from their families are displayed during a news conference on Tuesday in New York City. 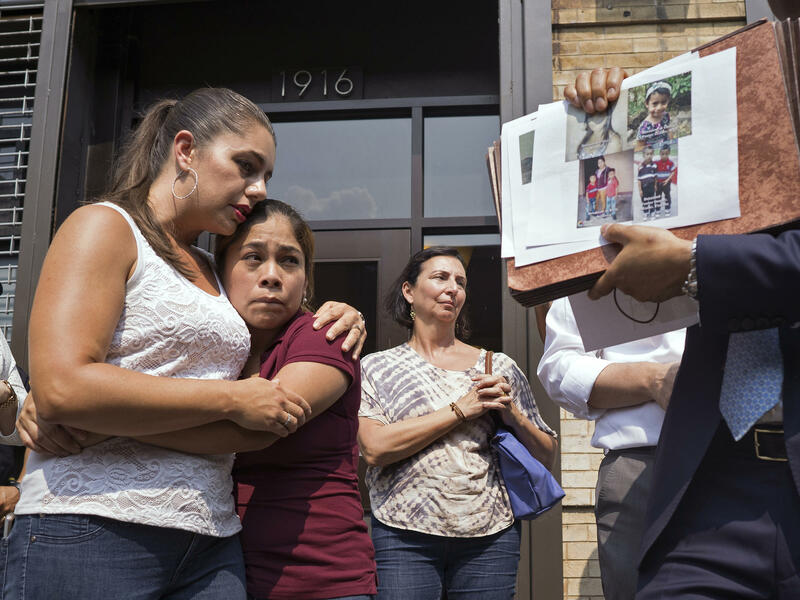 Gonzalez saw her children in a New York City facility for the first time since mid-May. Gonzalez travels in her lawyer's car after being released from detention in Eloy, Ariz. She was reunited with her three children on Tuesday in New York City. Gonzalez was detained at Eloy Detention Center in Eloy, Ariz.
A week ago, Yeni Gonzalez was in an immigration detention center in Arizona more than 2,000 miles from her children. On Tuesday, the 29-year-old stood outside the social services agency in New York City where she had just seen her kids for the first time in 45 days, clutching a blue and white lollipop in her hand. "I feel very happy because I just saw my children, and my daughter gave me that lollipop," Gonzalez said in Spanish. Their reunion Tuesday in Harlem was emotional. But it was also temporary. Gonzalez and other migrant parents still face major obstacles before they can regain custody of their children. Gonzalez and her children — ages 11, 9 and 6 — crossed the U.S. border illegally and were apprehended by the Border Patrol. Then she was held by immigration authorities at Eloy Detention Center in Arizona, while her kids were sent to New York. Gonzalez hadn't seen them since May 19. "The day they took them away, I told them, I promise that I'm going to fight for you, and I'm going to find you," she said in Spanish. "And we saw them, I got on my knees, and I hugged them, and I said I promised I would come get you, and I'm here." But the reunion was bittersweet because Gonzalez can't take her children home. At least, not yet. A federal judge has ordered the Trump administration to reunite roughly 2,000 migrant children with their parents before the end of the month. 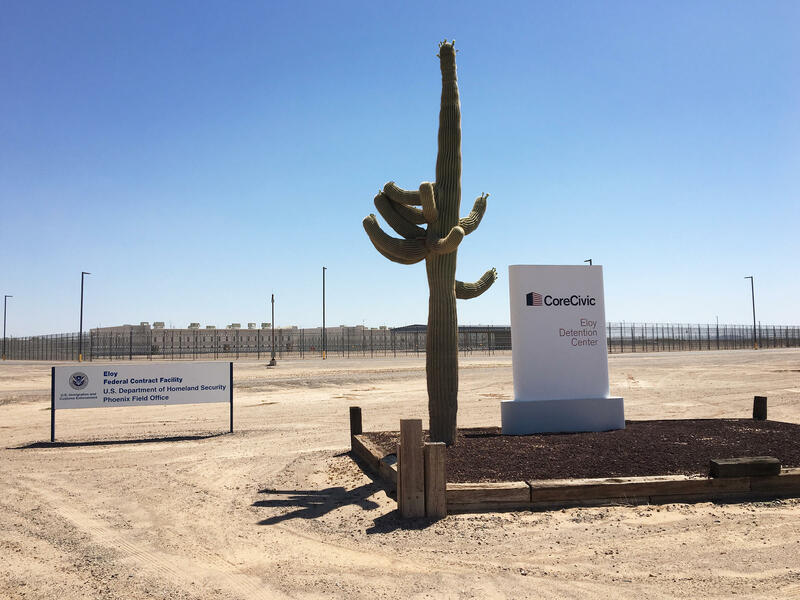 However, immigrant advocates say the government is in no hurry to release parents from immigration detention or help those who are released regain custody of their children. Jose Orochena, Gonzalez's lawyer, says he represents a dozen parents who say they were also separated from their children. The Office of Refugee Resettlement, which is charged with caring for those children, won't release them to sponsors — even biological parents — without a background check. ORR says it's trying to protect children. But Orochena says there's no reason it should take two months to collect fingerprints and inspect an apartment. "It's so much red tape," said Orochena. "I mean, c'mon, how is it that we can send rocket ships into outer space and we can't reunite families here?" he asked. That Gonzalez has made it even this far is remarkable. Dozens of people she had never met helped drive her across the country from Arizona to New York. The effort to get her to New York started with Julie Schwietert Collazo, who heard about Gonzalez and her children in a story on member station WNYC. In just a few days, Schwietert Collazo raised enough money to pay Gonzalez's bond and get her out of immigration detention. "I wasn't surprised at all," she said. "You don't mess with the kids. They are off limits. But in this administration, they're not off limits." The Trump administration says it wants to stem the tide of asylum-seekers fleeing violence in Central America. It has backed down from separating parents and children, but the administration shows no sign of releasing these families into the U.S. while their asylum claims are pending. The administration told a federal judge it intends to either hold the families in detention for as long as their immigration cases take or deport them. Gonzalez had a message for parents who are still in detention. "What they are going through is not easy," Gonzalez said. "But there are a lot of people with good hearts who are willing to reunite you with your children." Her supporters are already turning their attention to another case and trying to reunite families — one at a time. Forty-five days - that is how long it had been since Guatemalan migrant Yeni Gonzalez saw her children after they were separated at the southwest border. Their reunion today in New York City was emotional. It was also temporary. As NPR's Joel Rose reports, Gonzalez and other migrant parents still face major obstacles before they can regain custody of their children. 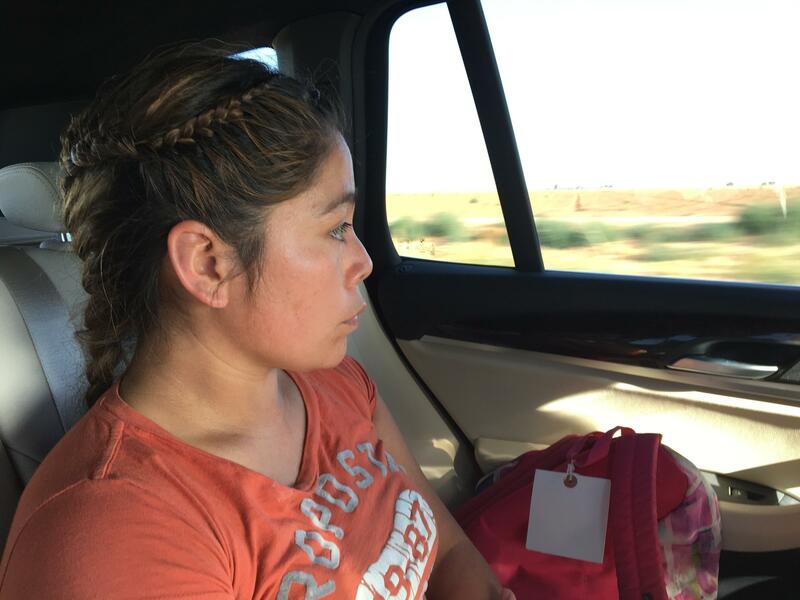 JOEL ROSE, BYLINE: A week ago, Yeni Gonzalez was in an immigration detention center in Arizona more than 2,000 miles from her children. Today she stood outside the social services agency in Harlem where she had just seen her kids for the first time in over a month, clutching a blue-and-white lollipop in her hand. YENI GONZALEZ: (Through interpreter) I feel very happy because I just saw my children, and my daughter gave me that lollipop. ROSE: Gonzalez and her children, ages 11, 9 and 6, are seeking asylum in the U.S. after fleeing violence in Guatemala. They crossed the U.S. border illegally and were apprehended by the Border Patrol. Gonzalez was held by immigration authorities in Arizona while her kids were sent to New York. She hadn't seen them since May 19. GONZALEZ: (Through interpreter) The day they took them away from me, I told them I promise that I'm going to fight for you, and I'm going to find you. And when I saw them, I got on my knees, and I hugged them, and I said I promised I would come get you, and I'm here. ROSE: But the reunion was bittersweet because Gonzalez can't take her children home, at least not yet. A federal judge has ordered the Trump administration to reunite roughly 2,000 migrant children with their parents before the end of the month. However, advocates say the government is in no hurry to release parents from immigration detention or to help those who are released regain custody of their children. JOSE OROCHENA: This mother's in Arizona. This child is inside that building. ROSE: Jose Orochena is Gonzalez's lawyer. He points to pictures of his other clients, a dozen parents who say they were also separated from their children. OROCHENA: It's so much red tape. I mean, come on. How is it that we can send rocket ships into outer space and we can't reunite families here? ROSE: That Yeni Gonzalez has made it even this far is remarkable. Dozens of people she'd never met helped drive her across the country from Arizona to New York. The effort to get Gonzalez here started with Julie Schwietert Collazo. She heard about Gonzalez and her children from a story on member station WNYC. In just a few days, Schwietert Collazo raised enough money to pay Gonzalez's bond and get her out of immigration detention. JULIE SCHWIETERT COLLAZO: I wasn't surprised at all. You don't mess with the kids. You just - they're off limits. But in this administration, they're not off limits. There's nobody off limits. ROSE: The Trump administration says it wants to stem the tide of asylum-seekers fleeing violence in Central America. It's backed down from separating parents and children. But the administration shows no sign of releasing these families into the U.S. while their asylum claims are pending. The administration told a federal judge it intends to hold families in detention for as long as their immigration cases take or deport them. Today, Yeni Gonzalez had a message for parents who are still in detention. ROSE: "What we went through was not easy," she says. "But there are a lot of people with good hearts who are willing to reunite you with your children." Gonzalez's supporters are already turning their attention to another case and trying to reunite families one at a time. Joel Rose, NPR News, New York. Transcript provided by NPR, Copyright NPR.